Whole food supplements are what their name suggests: Supplements made from concentrated whole foods. The vitamins found within these supplements are not isolated. They are highly complex structures that combine a variety of enzymes, co-enzymes, antioxidants, trace elements, activators and many other unknown or undiscovered factors all working together synergistically, to enable this vitamin complex to do its job in your body. Nutrients from within this complex cannot be taken apart or isolated from the whole, and then be expected to do the same job in the body as the whole complex is designed to do. For instance, vitamin C (ascorbic acid) or vitamin E (alpha tocopherol) you can find on most health food store shelves. They are parts of an entire complex that serve a purpose when part of the whole. However, they cannot do the job of the entire complex by themselves. Vitamin C for instance in a lab created standard multi-vitamin is missing P,K,J Factors, Ascorbinogen, Bioflavanoids, Tyrosinase and more. Whole food vitamin C or “living” Vitamin C has all of these things bound to it to make it fully bioactive in the body right when you take it. One can analyze what a typical synthetic multivitamin truly is. The automobile equivalent of creating a multivitamin would be going to a junk yard, finding all of the separate parts you would need to make up an entire automobile, throwing them together in a heap (or capsule in terms of the multivitamin) and expecting that heap to drive like a car! Obviously, there is a difference. Science cannot create life. Only life can create life. 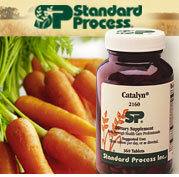 We currently carry Standard Process whole food supplements that have been around since 1929!